August 20 1977 1st Footbag Event 1st Annual Easter Seals Kick-A-Thon (Delta Park, Portland Or) which was a Consecutive kick event. December 1977 1st Footbag Tournament 1st Annual Hacky Sack Holiday Tournament A consecutive kick competition. During this tournament a volleyball net was available in an upper gym and the first experiment with playing over an 8 foot with 5 people on a side with maximum of 5 kicks allowed. 1978 No tournaments were held but some key milestones were accomplished. At a sporting goods show in San Diego California, experimentation of playing over a 3 foot net on a tennis court occurred. An appearance during the halftime of a Portland Trailblazer game. Demonstrated over a 8 foot high net with 3 people on a side using 5 kicks. July 1979 1st Footbag Net Tournament MDA (Muscular Dystrophy Assn)/Hacky Sack Challenge at the KGW Neighborfair. The competition was over a 8 foot net with 6 doubles teams. November 1979 1st Footbag Net Tournament over 5 foot net Roseburg Net Tournament Doubles competition. 1979/1980 1st Footbag Clubs Formed "Footbag Pioneer Club" in Oregon City, Or and "The Flying shoe" in Eugene. Footbag Pioneer Club Members: John Stalberger (HOF),Ted Huff (HOF), Garwin Bruce (HOF), Lori Jean Tarr (Conover) (HOF), Mag Hughes (HOF), Mike Noonan (HOF), Robert Conover (HOF), Billy Hayne (HOF), Cheryl Aubin (Hughes) (HOF), Rita Buckley (HOF), Dave Hill (HOF), Shannon Aubin, Clarke Schneider, Richard Smithson, Bart Brocklehurst, Gary Finley, Ed and Dean Redwing, Dennis Mackler, Doc Yates, Brian Brown, Misty Helms. The Footbag Pioneer Club and the Flying Shoe Club sponsored 10 to 15 tournaments, plus attending tournaments all over the Northwest, a year from 1980 to 1983. April 1983 Danish Footbag Association held the very first tournament First Danish tournament in Skelskor in Denmark on Saturday the 16. April 1983. 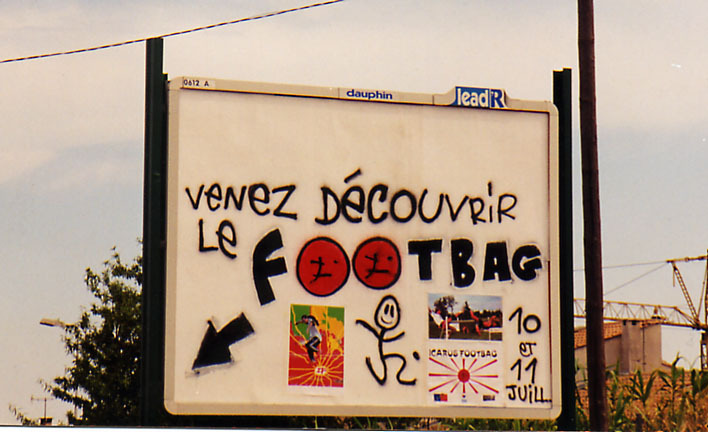 It was also the first footbag tournament in Europe. The tournament was called "Worlds 1st Danish Hacky Sack footbag Championships" and the name of some of the hacky sack clubs who particpates was "Jumpin' Jack Flash Hacky Sack Stars" and "Zick Zack Hacky Sack". Net Hacky both single and doubles were played and also Hacky Golf, Long kick, Most kicks and Freestyle kicks. Six teams competed in doubles net at the first edition of the French Open. Winners:[Olivier Gonelle] and [Miquel Clemente]. ==2007 -== se realiza por primera vez un torneo en Amï¿½rica del sur, y se da en la ciudad de MEDELLIN, 1ER suramericano de Footbag. This page was last modified on 11 April 2018, at 09:24. This page has been accessed 44,502 times.